Since I have now annoyed all my friends with my analysis of the Roswell documentation and how some of it is quite suggestive that nothing alien fell there, I thought it time to annoy all my skeptical friends. Lining up against that documentation is the testimony of some people who were on the scene in 1947. This is based on the documentation we can find about them and the stories they tell us in the world today. dictation from Colonel William Blanchard to create the press release. At this point it doesn’t really matter. 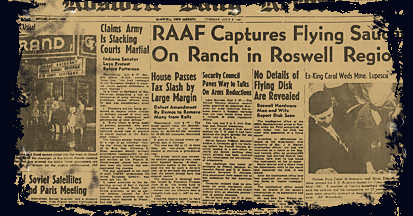 The press release was issued and it claimed they had “captured” a flying saucer in the Roswell region. The definition of flying saucer confuses the issue, because in 1947, there was no universally accepted definition. It could mean almost anything you wanted it to mean. But here’s the deal. It is vague to the point of being opaque. We don’t know what it means. I have never understood the reason for the press release. If Blanchard was attempting to grab credit for solving the flying disk mystery, the press release was unnecessarily obscure. Compare it to the story out of Circleville, Ohio, in which a farmer found the remains of a weather balloon and rawin reflector on his land. We have a story in the local paper that identifies the farmer as Sherman Campbell and includes what is claimed a picture of his wife. When I talked to the family, I learned it was actually his daughter holding the rawin target. The point is that the Circleville newspaper story was clear and it included a photograph. The Roswell press release told us nothing of real importance, provided little in the way of verification and had no photograph. We do have testimony from Haut, which, if we limit it to what was said in the press release, and what he said to us for decades before expanding his story, we learn that what was found was something strange. No, it tells us nothing about the alien nature of the crash, just tells us that Blanchard and company were perplexed by something they should have been able to identify easily if it was a weather balloon. No reason not to supply the explanation if it was something mundane, like was done in Circleville. 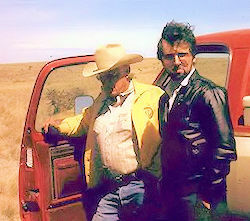 Taking that a step farther, he told family members about the alien “creatures.” That was his word to them, not mine. Sure, that statement is second hand at best because we learned it talking to family members, but hey, it does confirm his mindset on this. No, there is no reason for Easley to have lied about it. He was very reluctant to talk, didn’t grant much in the way of interviews, and you won’t see him showing up in any of the old documentaries. I was always of the impression he wished to help me, but he had taken an oath in 1947 and he wasn’t going to break the oath. Okay, this doesn’t get us to the extraterrestrial, but it does move us away from the conventional. It suggests things in Roswell were, well, up in the air in 1947. If he was stand alone, we could certainly dismiss his testimony. But it is not and while it is true that he seemed to drift all over the place before he died, he did say some provocative things about what he had seen and had done. These were backed up by his son and his wife. Still, we need to sound a note of caution when dealing with the senior Marcel. This debris included something that resembled fiber optics, a lead foil that seemed to have a memory, returning to its original shape when crumpled, and something that was as light a balsa but with a strength that rivaled steel. 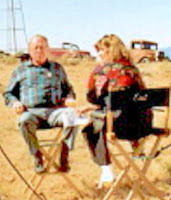 Although he lost the debris to Air Force personnel in 1949, he did show it to several others including Sallye Tadolini. Some of these witnesses, who handled the debris have affidavits about it. Of course, Mack had shown a bit of the debris to Floyd and Loretta Proctor. She told me about the fire-resistant capabilities of the material. She mentioned, as did Marian Strickland, that Mack had been held by the military authorities for a number of days. And I don’t want to forget Bill Rickett, the CIC NCOIC in Roswell in July 1947. He talked about his trip to see the crash site, some of the debris that he saw there, and some of the people on the scene including Sheridan Cavitt and Edwin Easley. These are some of the things that I think about when I’m not worrying about the documents that I mentioned in the last post. Most of the people mentioned here, and a dozen or two more that I could have brought up argue against the documents conclusion. While it is true that a few people might be inventing their tales, and we’ve had more than our share of them, there are some very solid people who had talked about their involvement. If I’m willing to concede some points based on the documentation, it seems only right that those at the other end of the spectrum admit that there are some disturbing testimonies. They all aren’t lying, looking for their fifteen minutes, and just wishing to have an interesting story to tell.